Editor’s Note: This paper leads us from the basics of wikis for teaching and learning to Wikipedia and a whole new concept of productive activity for faculty and students. It explains the value of wikis for teaching and learning as compared to web pages. It goes on to show the power of open source learning and the Wikipedia. Most important, it shows how the Wikipedia and global peer review can directly and immediately influence the quality and relevance of teaching and learning in classrooms and learning spaces today. Wikis are a very versatile and easy-to-use tool that is finding increasing applications in teaching and learning. This paper will illustrate how teaching academics can join the wiki revolution. First. it will introduce the common wikis and then focus on Wikipedia, The Free Encyclopedia, which has become one of the most popular Internet sites and offers unique opportunities for teachers and learners. It will describe how wikis and Wikipedia are used as a teaching tool and how to develop them further. Wikipedia can be used for various assignments: for example, students can be asked to reference an unreferenced article or create a completely new one. In doing so, students will see that writing an article is not a 'tedious assignment' but an activity that millions do 'for fun'. By submitting their work to Wikipedia students will see their work benefiting – and being improved upon – by the entire world. Recently some new technology-related buzzwords have been making their rounds around the campuses. Blogs. Podcasts. Wikis. All of them represent far more then just new shiny gadgets for students to play with; they are new tools with potential to help teaching and learning, a continuation of the Internet revolution which happened barely over a decade ago that gave us now indispensable tools like email, web pages and course management systems. This paradigm shift offers us new opportunities, and none as promising as the 'wikis'. The most popular one is Wikipedia, The Free Encyclopedia. Wikis are collaborative websites where anybody can edit and publish. The reason for their growing popularity is they allow users to create and change content more easily and quickly than with traditional websites do. All one needs to edit a wiki is a computer with Internet connection and web browser. Users do not need to spent days learning html or other programming languages – wiki syntax is intuitive and people working on their first wiki can create and publish a basic page in a minute or less. This ease of editing means that the teachers and students can quickly learn and start expanding any page or site, and those pages can be used for discussion, posting assignments, and various collaborative projects. The latter is the real strength of wikis. With wiki technology it is very easy to work on a collaborative document, track work in progress and see how much each individual in a group has contributed to the assignment. Wiki technology promises to revolutionize collaborative assignments in academia and beyond. In particular, Wikipedia, the collaboratively created encyclopedia, is a valuable tool for group writing assignments that involve referencing, translating, or copy editing. Wikis are relative newcomers to the Internet and recently recognized as viable tools for teaching. Most publications about educational uses of wikis originate from fields related to computer sciences (Augar, Raitman and Zhou 2004, 2005; Gabrilovich and Markovitch 2006 ; Guzidal 1999; O'Neill 2005). The goal of this paper is to illustrate how academia can join the wiki revolution and enhance its courses beginning with a discussion of the common wikis and then focus on Wikipedia., which offers some unique opportunities for teachers. In each of these two sections a description of how it is being used as a teaching tool will be followed by suggestion of ways to further develop and apply wikis to teaching in higher education. A 'wiki' can refer either to a type of a website or a software run by them. The word 'wiki' comes from Hawaiian and means 'fast', fitting the wiki phenomena quite well. The first wiki was created in 1995, but it was the success of Wikipedia that popularized this technology. There are now thousands of wikis on the Internet and their numbers are growing rapidly. There are three important characteristics that differentiate wikis from traditional websites. First, one does not need to download any software to work with wikis. Second, learning how to edit a wiki is very easy and intuitive. Third, by default, wikis are designed to support collaborative projects and allow virtually anybody to edit anything. To create a new wiki one can download any of the available wiki packages, many of them free under open source licenses. However it is worth emphasizing that it is not necessary to have one's own dedicated wiki website for the purpose of using wikis as a teaching tool. SCORES of educational wikis AREalready running on existing wiki servers ('wiki farms'), either free of charge (supported by ads) or with subscription around several dollars per month. an increasing number of universities (or their departments) are launching their own wikis for faculty and students. if we are linking to a page entitled ‘ name of website ' that already exists in a given wiki. Some wikis, such as Wikipedia, do not even require the user to know the wiki syntax. They provide users with an editing toolbar to add syntax elements similar to the way formatting is added in a word processor (highlight and click). In a recent study of wikis used in classrooms, Augar, Raitman and Zhou (2005) found that 73% of students found the wiki software easy to use while Farmer (2004) notes that Wikipedia, the most popular wiki (see Figure 1), is being successfully used and edited by millions of not always very “tech-savvy users”. A “WYSIWIG” Wikipedia editor announced at the Wikimania 2006 conference should make editing Wikipedia and MediaWiki-based wikis even easier. Figure 1 'Sociology' article from Wikipedia. Note 'edit this page' tab at top of the page. Because of their nature, wikis have two versions, one for users, and one for editors, which Augar, Raitman and Zhou (2004) name read and edit. 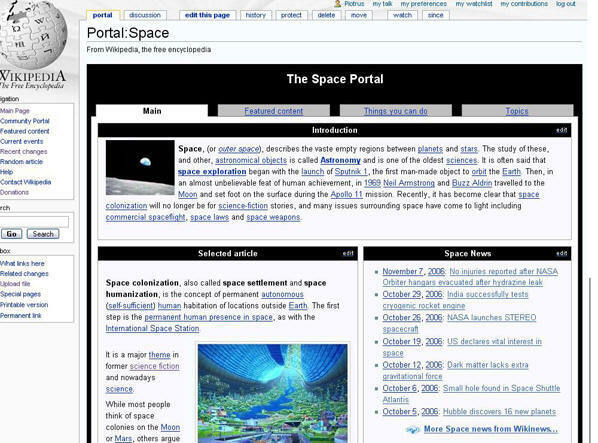 The read version is the one seen by all users who are not editing the wiki and it resembles an average webpage (see Figure 1). This is usually the version that the creators of the wiki want to show to the majority of end users, who come use the information, not to contribute. When a user wants to edit a wiki page, they use the edit version, which is usually accessed by clicking a link labeled 'edit' on the wiki page (see Figure 1). This launches a miniature version of a text editor built in into each wiki (see Figure 2). Anybody who uses a wiki is a 'user'. When a person clicks the 'edit' button, changes the article and then clicks the 'save' button, this act transforms the user into an 'editor'. Usually there is no application, external review or other process involved, although many wikis allow their owners to set up various barriers, such as passwords, to control entry. Any person with an Internet connection can, in just a few seconds ,become an editor on most wikis. However, on any large wiki it is virtually impossible for a single editor to enforce a major change by himself, since any edit can be easily 'reverted' by others, and usually there are many people following the changes to a given article. Controversial edits (or plain vandalism) are quickly spotted and reverted unless the editor in question can convince others of the merit of such edit. Therefore the content of wikis over the longer period will reflect content that has gained approval of the user community or is not controversial. As changes accumulate and the number of editors increases over time, a wiki becomes a representation of the negotiated beliefs and knowledge of the user community (Leuf and Cunningham 2001). Figure 2 This is the same 'Sociology' page from Wikipedia as seen on Figure 1. Because wikis were designed to be collaborative editing tools, they also offer an easy way for editors to hold discussions in a manner similar to listserv or message board. Such discussions usually take place on 'talk' pages which accompany every article (see Figure 3). As such, wikis can be said (Augar, Raitman and Zhou 2004) to have two different writing styles: the document style which is used for editing the main content visible to end users, and the thread style which is used by editors to communicate with each other. In document style contributors work on websites, collaborative documents or any other type of content whose creation is the primary purpose of a particular wiki project. In thread style the editing is quite different: contributors engage in discussions by posting signed messages representing their individual opinions, others respond below, leaving the original messages unchanged, in what is also known as the 'bottomposting' style. The end result looks strikingly similar to a series of Usenet, listserv or message board threaded messages (Leuf and Cunningham 2001), often resembling 'message trees' enriched with hyperlinks to other relevant discussions, making it easy to follow multiple conversations on wikis. Figure 3 This is the talk page of 'Emile Durkheim' article. discuss various issues related to the content and layout of the article. In addition to the ease of interaction and operation, wikis have a variety of other features which are useful in the e-learning environment. They record each change that occurs over time, so that at any point a page can be compared and reverted to any of its previous versions – a useful tool that is missing from many text editors (see Figure 4). (at the top of every wiki page), we can easily see what has been changed in the article. Most wikis have an editing toolbar, eliminating the need for one to learn a wiki syntax. They are also searchable and indexable, allowing users to categorize pages into a taxonomic system of their choice. Furthermore, they support easy addition of hyperlinks, provide every content page with its dedicated discussion page, allow for user authentication and different access levels, inform interested users when a particular page has been edited, and allow easy viewing of all contributions by an individual user. These features make wikis an effective tool for collaborative writing. Barely two years ago Lamb (2004) noted that “wikis are already making their mark in higher education and are being applied to just about any task imaginable. They are popping up like mushrooms, as wikis will, at colleges and universities around the world”. Schwartz et al. (2004) concluded that they were “able to locate numerous examples of the growing wiki trend in education“ and it is already “difficult to estimate the number of wikis currently used in university settings, and the range of ways in which they are being used.” However a year later Augar, Raitman and Zhou (2005) argued that “Wikis are everywhere, but, unfortunately, the online literature has not yet begun to focus enough on wikis”. Yet every coin has another side. Because of this proliferation of Internet-related technologies we often find ourselves often swamped with more available tools that we can learn and use efficiently in the time available to us (Bills, Stanley 2001). This raises the question: are wikis offering us something that is substantially more useful compared to what we previously had? Should we devote some of our time to learning how to incorporate wikis into our teaching activities? I would argue yes! Wikis may or may not herald a 'revolution', but they are certainly one of the best tools to emerge for teaching and learning in the past few years. Many students now “come to campus to learn about and learn with technology” (Green, 2000) Learning is enhanced through the user friendliness of wikis (Raitman 2005), “minimal technical skills“ for end-users (Schwartz et al. 2004), the intuitive interface compared to html web pages, and the increase in computer-related knowledge of each new cohort of students. (Brooks 1997). This means students are increasingly likely to be familiar with wikis, just as they are quite familiar with the personal computers, the Internet; and email. What is more, they expect their teachers to be familiar with those tools also. Wikis can be used for any task served by traditional web pages. Ease of editing means that even without additional features wikis are preferable for many purposes. Wikis duplicate features of html pages – like the ability to display text, images or hyperlinks – and add collaborative editing and other technical options without the need to download and install any software - any user can edit, there is a backup copy of every edit allowing comparisons between various versions and editor, and there is an editable discussion pages for every content page. As a further incentive, wikis are easily integrated with most teaching software, like Blackboard and other course management systems, either through a dedicated plug-ins or addition of a URL link. Wikis are valuable for active learning. They seamless shift between the teaching paradigm and the learning paradigm and allow students to actively engage the material in ways difficult or impossible to achieve with traditional pages. Wikis are more than 'streamlined webpages', they allow us to design new teaching activities impossible without them. Allowing students to actively discover knowledge can increase the efficiency of teaching (Wagenaar 1995) and has a positive impact upon students' learning (Ruhl, Hughes and Schloss 1987). It increases the students' interest and involvement in the subject matter, the amount of knowledge they retain, and facilitates teacher-students’ contact in distance learning. Wiki is a practical choice for cooperative (team-based) learning activities by facilitating interaction between co-workers. Such active learning often involves group members working together to solve problems leading to increased understanding of concepts to be learned. The less able or less experienced students are helped by these group activities, and more competent students reinforce their knowledge as they explain the material to others (Stahl 1994). Because a students’ progress on wiki is visible to teachers and their peers, students may be encouraged to work on a continuous basis, instead of leaving most of the work for the last weeks (or days) of the term. Studies on collaborative and cooperative learning suggest that interaction is the most important part of the virtual classroom; the interaction with other students and increased contact with the faculty have a very positive effect (Kuh 1996), being a key element in active learning and reinforcement of knowledge (Dewald et al. 2000), resulting in an improved academic environment(Astin 1996). 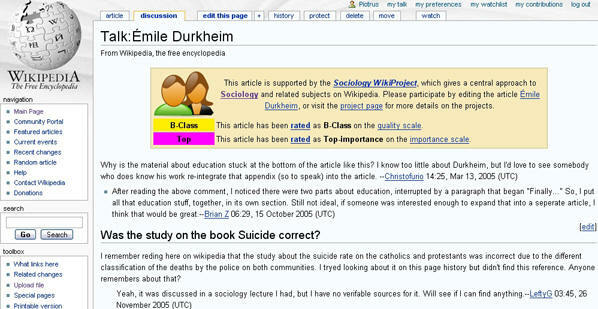 Several useful observations specific to use of wikis were noted by Raitman (2005), who researched students perceptions of working in the wiki environment: 92% of the students participated with continuous activity, 73% found the wiki software easy to use, and although the majority of the students thought that the use of wiki increased their comprehension of material only 'slightly', they also felt that working with wiki was quite enjoyable. Raitman notes that “it is clear that there are many ways in which the students were suitably impressed” by the usage of wiki, especially by a new, asynchronous model of communication, which made collaboration easy and more relaxing, and by the general ease and user friendliness of the wiki technology. There were aspects that caused concern for students: many complained that the wiki used for the course project was 'too simple' and should have more functionality (like in the more advanced MediaWiki engine used on Wikipedia). Students also feared that a malicious user could destroy their work (even through no such incident occurred); this means that it would be prudent to instruct students how easy it is to revert any vandalism done to their work, and recover any data that was edited out at any point in time. It would be worthwhile to encourage or even oblige students to check others progress and comment on it, as many students display an initial lack of willingness to edit the work of others (seeing it as “impolite”) and dislike having their own work edited and criticized. Such behavior is not surprising and certainly not limited to online environments (Becker 1986), but with wikis, designed from bottom up to support discussions on work in progress, it seems a shame not to utilize their capabilities in that regard, especially as a recent study (Forte and Bruckman 2006) further confirms that students appreciate having an audience that can comment on their work, and it improves the quality of their writing. Many wiki activities can be seen as expansions on what has been already achieved, such as Ammarell's network groups exercise (Ammarell 2000). He divides students into small groups that discuss and critique their writing in class and over the Internet. Ammarell, who builds upon Jaffe's (Jaffe 1997) 'asynchronous learning networks', notes that such an environment can enhance collaborative, interactive and integrating assignments. Students are more likely to take risks, communicate and defend their ideas, discuss controversial issues in online groups and create situations where students are both teachers and learners. Again, wikis with their peer-review functions make such activities much easier, which should likely be even more valuable to courses discussing controversial issues as in social science courses. easy course administration, timetabling, etc. Particularly impressive university wide-wikis can be seen at Case Western Reserve University and the University of Calgary. Case Wiki is “an encyclopedic reference about Case Western Reserve University and its surroundings”, while Calgary Wiki “provides collaborative content management in the context of teaching and learning to the University of Calgary community”. What makes those sites novel is that their content can be created by any member of the university community, not just the site’s maintainers. They offer wealth of information about their respective universities, information that is constantly expanded and updated by interested users. They provide web hosting for faculty and students, featuring pages devoted to online syllabi, students' collaborative projects, departmental webpages and other educational pages. Still, university wide-wikis are relatively rare. Some wikis are run by certain departments, like Microsystems Design Lab Wiki at The Pennsylvania State University, but there are also many wikis run by single individuals, centered around particular courses, such as English 242: The Romantic Audience at Bowdoin College or Eng 602: English Fifteen in 15 Weeks, an instructor-level course for English 15: Rhetoric and Composition at Penn State University, which also has its own wiki, or Ethnographic Methods from Dong Hwa University in Hualian, Taiwan. Benson at al. (2002) note there is a significant difference between using technology to supplement traditional methods of teaching, and using it “to create opportunities for new objectives that may not be possible without them.” Web-based instructional technologies are capable of reshaping role behaviors and social relations between students and teachers. Jaffe (2003) notes that it is vital how we use this technology, which has the potential to revolutionize the world of teaching and learning. Indeed we can see examples of projects that would be rather impossible before the advent of wiki technology. J. Moxley from University of South Florida created one of the best known academic teaching wikis, the TeachingWiki: “Teaching Wiki aspires to be a community for college-level faculty, particularly faculty teaching rhetoric and composition. However, as we invoke the wiki way here, we invite all college faculty and instructors to be wikiteachers with us. Feel free to use this site to reflect on teaching practices, cite resources and provide lesson plans.” This project is quite similar to Wikiversity, one of the newest endeavors of the Wikimedia Foundation (a non-profit NGO responsible for support of Wikipedia). Wikiversity declares its goals as to “create and host a range of free learning resources for educational processes, for all age groups in all languages; generate projects to interface with existing Wikimedia projects; host and foster research based in part on existing resources in Wikiversity and other Wikimedia projects. Other tasks and goals are initiated and pursued as articulated by participants according to personal priorities and self managed efforts”. Wikiversity already has dozens of schools, from 'School of Engineering and Technology' to 'School of Fine Arts', offering many free textbooks (like 'Introduction to Sociology', 'Intermediate Microeconomic Theory' and 'Orthopaedic Surgery'), and the interesting opportunity of creating a course exercise in which students collaboratively work on a textbook (incidentally such free textbooks offer a possible solution to the problem of raising costs of our normal academic aids). Interestingly not all wikis are 'top-down', some spring from the desire of students to use the new technology themselves. 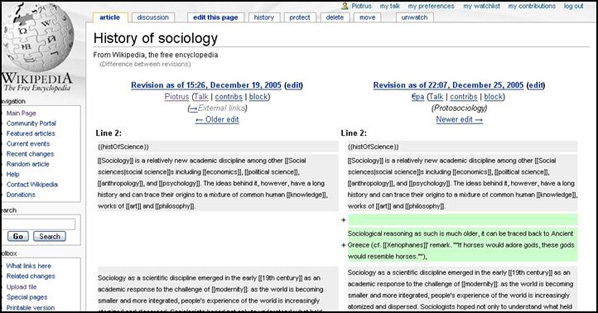 Consider Sociowiki – “a project dedicated to compiling, organizing, and making available information useful to aspiring and current sociologists. Sociowiki is currently maintained primarily by the Sociology grad students of UNC-Chapel Hill“– a website created by the students for the students and faculty. Among the most innovative projects, Bruns and Humphrey (2005) describe a very unique example of coursework using wiki technology: “M/Cyclopedia of New Media”, a project of Creative Industries Faculty at Queensland University of Technology. M/Cyclopedia is an encyclopedic collection of information on new media concepts and topics developed by over 150 editors, mostly students. Bruns and Humphrey (2005) note that the first edition of this exercise has been very successful, and already international new media academics have expressed an interest in having their classes collaborate on that wiki; similar projects have been considered by others (Santally and Senteni 2005) and others are being actively pursued, such as the 'Science Online' 'online science encyclopedia collaboratively authored by high school and undergraduate students' (Forte and Bruckman 2006). In their review of the otherwise impressive M/Cyclopedia project Bruns and Humphrey point out that by developing their own, separate encyclopedia the authors encountered several problems. Fewer editors means that factual or stylistic errors on M/Cyclopedia may go uncorrected for a long period of time; it is difficult to copy many of Wikipedia's specific tools or solutions (like its categories and templates) and some students duplicate work already done on Wikipedia.. As M/Cyclopedia faculty and students learned much from 'virtual field trips' to Wikipedia, this raises an interesting point: why go to all the trouble to create a dedicated wiki for a small group of students, if one can work on Wikipedia itself? Wikipedia is first and foremost an encyclopedia (Wales 2005), or as it defines itself, “a multilingual Web-based free-content encyclopedia” (Wikipedia 2006d). As the name suggests, Wikipedia is a wiki: an encyclopedia written collaboratively by volunteers. Among the guiding principles of Wikipedia are the following four policies. First, “Wikipedia is an encyclopedia”, meaning that it is a secondary source where non-encyclopedic content, or original research, is not acceptable. Second is the "neutral point of view" policy, which advises how to avoid bias and summarizes notable approaches without an attempt to determine an objective truth. Third is “Respect copyrights”, a rather self-explanatory policy, however with a twist: Wikipedia itself is licensed under a GNU Free Documentation License” (GFDL), an open source license developed by the Free and Open Software Movement, which basically gives the users of Wikipedia the freedom to use the content as they wish, provided they don't change the license. Fourth is “Respect other contributors”, an advice good for any community (Wikipedia 2006b). The project is young, having been launched by Jimbo Wales and several others only on January 15 , 2001, and is now operated by the non-profit Wikimedia Foundation dedicated to supporting the growth of Wikipedia. Yet despite its relative youth Wikipedia's growth has been impressive: Wikipedia's own statistics for 21 August 2006 show that it had more than 5,300,000 articles in many languages, including more than 1,300,000 in the English-language version (Wikipedia 2006e). This growth was possible because the wiki’s user-friendly technology was able to attract hundreds of thousands of volunteers, from high-school students to professors emeritus, who found that contributing to the project can become a new hobby – something that hopefully an increasing number of students will realize. Wikipedia's free distribution, constant updates, diverse and detailed coverage, and numerous multilingual versions have made it now one of the most-used reference resources available on the Internet, coming increasingly high in search results of Google and other powerful search engines, thus being an important intellectual influence on many students and scholars. Wikipedia is growing nearly exponentially (Xiong 2005) and is now several times as popular as the Britannica (Graph 1). from late 2002 to 3rd October 2006. Source: Alexa Internet, Inc.
Not only is Wikipedia a leader in quantity of information, but its quality is also surprisingly good: a recent study in Nature argued that it is almost as reliable as the renowned Encyclopedia Britannica (Giles 2005), while another new comparison, recently published in The Journal of American History (Rosenzweig 2006), found it much more comprehensive then Microsoft's multi-million dollars commercial Encarta, and in some instances even comparable with respected academic sources such as American National Biography Online. However we look at it, the new model of Wikipedia seems to be working. Wikipedia's style, tone and content resemble traditional encyclopedic content quite well (Emigh 2005) and it is well on its way to become the 'largest database of human knowledge'. As with any new inventions, Wikipedia has faced its share of controversies, concerning primarily its reliability and accuracy; it has been criticized for its susceptibility to vandalism, uneven quality and inconsistency, systemic bias, and preference of consensus or popularity over credentials. In the world of academia many have found that Wikipedia’s popularity is becoming both a boon and a curse. A boon, as we have little to worry about students starting their research with Wikipedia, which has proven to be a reliable reference source no more to be withheld from students than any other encyclopedia. A curse, because we are increasingly faced with students who decide that they need to go no further in their search for sources, and in worst cases, use the dreaded 'copy&paste' technique and plagiarize content directly from Wikipedia. Yet, as Rosenzweig (2006) writes in his analysis of this problem: “Should we blame Wikipedia for the appetite for predigested and prepared information or the tendency to believe that anything you read is true? That problem existed back in the days of the family encyclopedia. And one key solution remains the same: Spend more time teaching about the limitations of all information sources, including Wikipedia, and emphasizing the skills of critical analysis of primary and secondary sources.” Therefore we should look at Wikipedia’s model, not the content, and employ it to teach students, whom we should see as a part of the knowledge-building community. Wikipedia's founder, Jimbo Wales, once wrote that “incidentally and unintentionally, Wikipedia has became 'a grand social experiment'” (Wales 2005). Let's now consider how we can turn Wikipedia into “a grand teaching experiment”. When you decide to experiment with wikis, you can create a free account on one of many wiki farms – but you can also consider joining the largest project allowing one to 'use wikis as a teaching tool'. Wikipedia:School and university project (SUP) is a place where a growing number of participants from around the world is utilizing Wikipedia in their classrooms. As of August 2006 the faculty from over 20 different universities had listed their own projects there (Wikipedia 2006c); it is likely that many more are simply not aware that a centralized listing and coordination project for their Wikipedia-related teaching projects exists. SUP offers advice, examples of what kind of assignments have been attempted, and with what results, and tools, including free copy & paste templates that can be quickly adapted to create wiki syllabi for any course. Out of those exercises writing assignments are and likely will be the most popular. Writing is of critical importance in developing students' skills and knowledge. The encyclopedic style of writing is fairly compatible with term papers and research reports, which are particularly useful in developing critical thinking and improving the comprehension of course materials (Grauerholz 1999). Bruns and Humphrey (2005) commented on the usefulness of Wikipedia’s Neutral Point of View policy which has the “requirement to present both (or the many) sides of an argument” and teaches students the value of objectivity and the collaborative process of negotiating over the content. Yet the question inevitably arises: why go to all the trouble and tell the students to work on Wikipedia, if they could just as well work on their assignments at a smaller, university- or course-dedicated wiki? There are several good reasons why working on Wikipedia is preferable. The most visible benefits are related to the Wikipedia’s unique scale, which results in several positive 'snowball effects'. First, the immense size of Wikipedia allows any number of students from different courses and universities to interact in a single environment, creating the 'global newsgroup' (Ammarell). Thus the students can receive feedback on their work not only from their teachers, group mates or course mates, but from interested editors from all around the world. Second, Wikipedia’s size answers one of the concerns often raised by students: that there is not enough connection between theory they are thought and 'real life' (Kivisto 2004). With Wikipedia it is extremely easy to link theory to relevant examples, as many real-life phenomena, including the realm of pop culture, familiar to students, are covered on Wiki. Thus a paper on 'parasocial interacton' can link to articles on 'talkshow host' and 'fictional character', and a paper on 'hearing loss with craniofacial syndromes' can link to 'Treacher Collins syndrome' and 'conductive hearing loss'. Wikipedia, which has over a million entries, allows students to use hyperlinks to enrich their papers by linking to various important concepts within Wikipedia which would not have their own entries on a smaller wiki, not to mention the ability to use one of over 700,000 free images from the Wikimedia Commons project (see Figure 5). 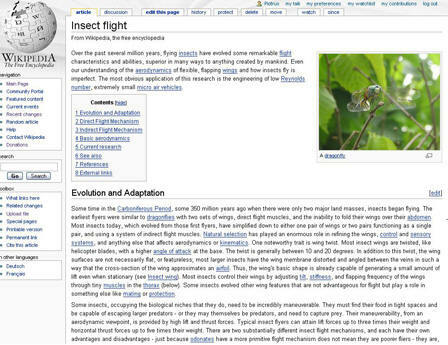 Figure 5 'Insect flight' is one of many Wikipedia's articles created by students as part of their course and listed at 'Wikipedia:School and university projects'. 'Science and technology studies' at University of Virginia. Third, they can use other tools which Wikipedia community has designed over the years but which would be difficult to transfer to smaller wikis, such as its extremely useful taxonomic system of categories (Gabrilovich and Markovitch 2006), International Phonetic Alphabet templates or accessibility tools, like the spoken versions of articles. 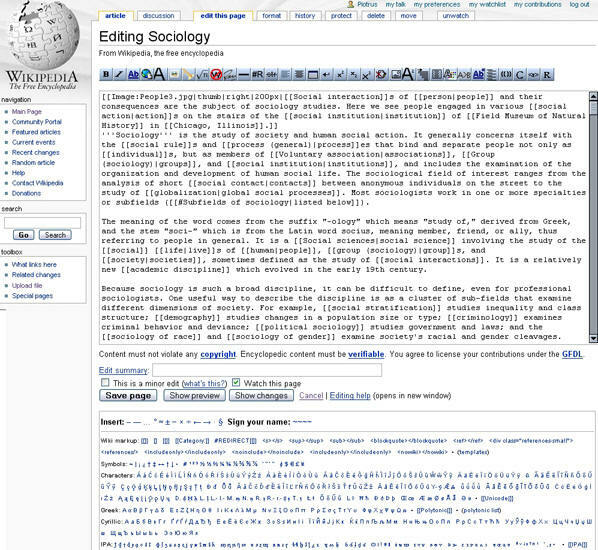 Wikipedia also has tools developed for editors that can be easily adapted for teachers: for example, articles are categorized based on their quality; tiny articles (called 'stubs') which are in need of significant expansion and improvement are further categorized (as 'sociology-related stub' or 'archeology-related stub' for example) creating useful lists of topics to which one can direct students (particularly from an undergraduate introductory course) looking for a topic related to the course discipline to write about (see Figure 6). which can be used as lists of subjects for written assignments. Each stub category contains at least 60 articles, often, hundreds. 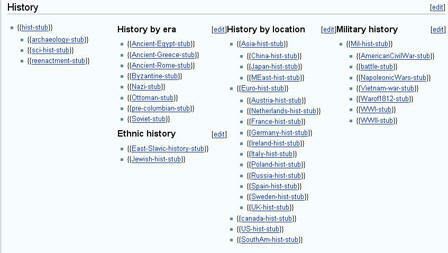 This is a partial list of main subcategories within the history-stub category. Finally one of the most important benefits of having students edit the Wiki is having them realize that they and everybody else will benefit from their efforts. An incredible amount of creativity is wasted around the world when students' papers are discarded after being graded. By submitting their work to Wiki not only will the students be able to access it from any place, any time, but it will bring benefit to – and be improved upon – by the entire world. Writing on Wikipedia means one is 'teaching the entire world'. In this aspect, Wikipedia contributions achieve the same result as the 'Random Acts of Kindness Journal' exercise described by Angela Jones (1998). Contributing to Wikipedia, seeing their work used, commented upon and improved by others, and likewise being able to help them with their articles, can show student that they have the power to make a positive impact on the social world, and illustrate how their efforts contribute to building both the largest worldwide encyclopedia and the Wikipedia community. 6) their contributions can be easily assessed and the community can contribute to the assessments (here wiki's collaborative nature and tools like talk pages become very useful). Another useful exercise one can perform with Wiki is to teach students the difference between primary and secondary sources, and how to move from a general source like Wikipedia to more preferred academic databases. Many students, especially undergrads, are having problems evaluating online sources (Hammett 1999). It is visible when they increasingly cite sources such as Wikipedia, usually without even knowing that it is a wiki editable by everyone. Even when one takes into account the recent studies about Wikipedia being as accurate as Britannica or Encarta (Gills 2005), the undergrads should avoid citing encyclopedias in their papers – this was pointed out, among others, even by the founder of Wikipedia himself (Chronicle 2006). On the other hand forbidding students to use Wikipedia is counterproductive; it gives them a further incentive to cheat and it delays their familiarization with the useful world of online tools, from Wikipedia to Google Scholar and Google Print. Such new tools should certainly be used with caution, but the students will benefit more if they are taught how and when to use them properly rather then being faced with a ban on using them. Having the students contribute to Wiki, especially giving them an assignment of referencing an unreferenced article with academic references, will make them realize what is a 'properly referenced, academic source' and what is not – and why Wikipedia is different from a typical academic journal. Writing and referencing articles is just the tip of an iceberg in terms of activities students can do on Wikipedia. They can join the efforts of projects like ‘WikiProject Countering Systemic Bias’ and see how articles are affected by, for example, an Anglo-centric world view. For research design and article writing classes they can see what it is to be a reviewer by reviewing articles at ‘Wikipedia:Peer review’, or improve their language by following ‘Wikipedia:Manual of Style’. For larger projects, they can create a WikiPortal (like the Rhetoric Portal created by students from St. Cloud State University). 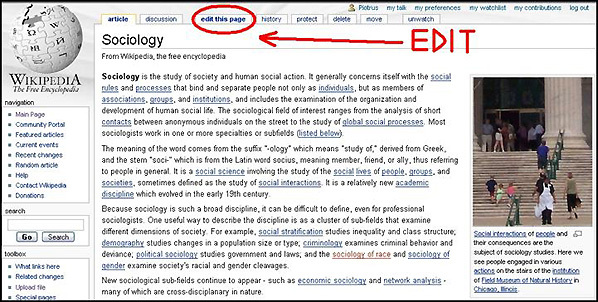 Finally they can simply see the pending task list at many WikiProjects; for example by becoming involved in a ‘WikiProject:Sociology’ they can help to improve the categorization of sociological subjects on Wikipedia, work on the ‘Sociology Collaboration of the Week’ or the Sociology Portal (see Figure 7). and maintaining a portal is just one of many activities that students can do on Wikipedia. Another interesting idea comes from the adaptation of the 'writing before students' activity suggested by Edwards (2002). If the teachers contribute to one or more Wikipedia articles, and keeps on doing this throughout the course, those experiences can be used to further increase the efficiency of any 'teaching with Wikipedia' activity. The students would feel a closer bond with the lecturers who would help them by illustrating the Wikipedia exercises with the stories of their own experiences on the site. Considering the nature of Wikipedia contributions – which are by their nature somewhat less stressful than contributions to an academic journal or book – we can circumvent some of the drawbacks of the traditional 'writing before students' exercise, such as problems with self-exposure, or overcomplexity of the issue. Wikipedia articles are written for the general public, thus they resemble popular press articles recommended by Edwards (2002). Edwards also notes that a major paradigm in sociology of knowledge states that “knowledge is created socially, is shaped by institutions and organizations, and is created through imperfect process of starts and stops.” Wikipedia certainly illustrates the truth of this paradigm. Many academics who became familiar with Wikipedia, like Rozenzweig (2006), suggest we have a responsibility to contribute our knowledge to that site. If we turn our contributions into teaching exercises, aren't we killing two proverbial birds with one stone? The classicist James O’Donnell as quoted by Rosenzweig (2006) has noted that Wikipedia may be more beneficial for its editors than for its readers: “A community that finds a way to talk in this way is creating education and online discourse at a higher level”. Rosenzweig also draws our attention to one of the greatest sociologists of our times, Robert K. Merton, and his concepts of “the communism of the scientific ethos,” and “communal sharing”, where scientific knowledge is treated as a communal good, freely communicated and distributed (Merton 1942). This bold idea is clearly illustrated on Wikipedia, where students will be introduced to the helpful Wikipedia community and see that the task of writing an article is not only a 'must-do assignment' but something millions of people do 'for fun'. I daresay that convincing a student that writing papers is 'fun' is always an impressive achievement, one that is likely to increase their lifelong interest in the academia – and Wikipedia seems to be a perfect tool for doing just that. This paper introduced wikis and Wikipedia and explained how they work and how they can be adapted to teaching. A brief analysis outlined several main features that make wikis suitable for use in an e-learning setting, with special attention paid to the possible uses and benefits of Wikipedia, the largest and most popular wiki. Wikis are free, reliable and user-friendly. However, they are not yet widely implemented in the education arena. Projects underway at the Case Western Reserve, South Florida, Penn State, Queensland, Chapel Hill and other universities offer specific examples on how teachers, academics and even students themselves are increasingly employing wikis in the field of social sciences to enhance both the process of teaching and learning. Although much technology needs yet to be developed before the concept of virtual universities becomes truly functional, wikis and Wikipedia offer an intriguing way for students can collaborate on real assignments in cyberspace. The opportunities offered by Wikipedia seem especially valuable as they merge some proposals from the radical pedagogy and use of computers in social science education paradigms under the service learning approach. Wikipedia is a tool that further “move[s] the discipline into a realm of collaborative learning”. (Brooks 1997) It allows us not only to enhance our portfolio of teaching strategies, but to transform routine class activities into something that can instill in our students the values of lifelong learning and scientific ethos, simultaneously contributing to the wider community. Bergin, Joseph. 2002. "Teaching on the Wiki Web." Pp. 195 in Proceedings of the 7th Annual Conference on Innovation and Technology in Computer Science Education. New York , NY: ACM Press. Bills, David B., Anthony Q. Stanley. 2001. “Social Science Computer Labs as Sites for Teaching and Learning: Challenges and Solutions to Their Design and Maintenance”. Teaching Sociology. 29:153-162. Godwin-Jones, Bob. 2003. “Blogs and wikis: Environments for on-line collaboration” Language, Learning and Technology. 7:12-16. Kivisto , Peter. 2004 Illuminating Social Life: Classical and Contemporary Theory Revisited. Pine Forge Press. Leuf, Bo and Ward Cunningham. 2001. The Wiki way: Quick collaboration on the Web. Upper Saddle River, NJ: Addison-Wesley Professional. Longworth, Norman. 2003. Lifelong Learning in Action:Transforming Education for the 21st Century. UK:Routledge. Merton, Robert K. 1942. “The Normative Structure of Science,” The Sociology of Science: Theoretical and Empirical Investigations. Pp. 275. O'Neill, Melissa E. 2005. "Automated Use of a Wiki for Collaborative Lecture Notes." Proceedings of the 36th SIGCSE Technical Symposium on Computer Science Education. New York, NY: ACM Press. Prensky, Marc. 2004. “Proposal for educational software development sites: an open source tool to create the learning software we need”. On the Horizon. 12:41-44. Stahl, Robert J. 1994. Cooperative Learning in Social Studies: A Handbook for Teachers. Menlo Park, CA: Addison-Wesley. Over the past two years he has became increasingly involved in theory and practice of teaching with new media. He is participating in the Wikiversity project, and has given a series of presentations about use of wikis and Wikipedia in teaching, most recently at the 2nd annual Wikimedia conference, Wikimania '06, where he participated in ‘Wikis in education’ track speaking on ‘Wikimedia projects as a teaching tool’.